Last year August was my first met with Johnnie Walker. 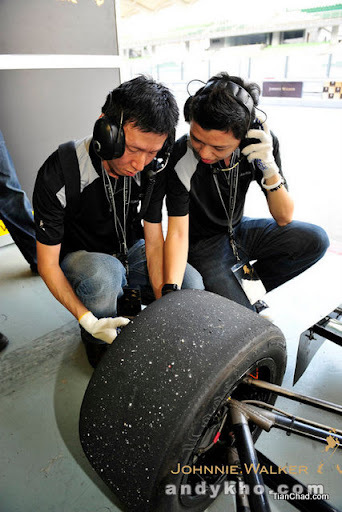 JW was offering Malaysians the once-a-lifetime opportunity to step inside the Black Circuit and experience the exclusive + high pressure world of motor racing that took place at the Sepang International Circuit, home of the Malaysian Formula 1 Grand Prix. It is definitely great to step inside the Black Circuit =) You can read more about my experience and encounter @ My Johnnie Walker Pit Crew Experience! A night to party with show-stopping entertainers Havana Brown from Australia, DJ Andrew T of Singapore, and KL's very own DJ Goldfish. Still remember the classy decoration inside the lounge. Fascinating lighting playing along DJ's music in the hall. And of course the gorgeous crowd who partying hard with the luxurious drinks Black Label. It was so quick that 2010 has passed and Johnnie Walker, the World’s number one Scotch whisky + global partner with VMM for highly successful Formula One team McLaren Mercedes, once again will be bringing Malaysians the ultimate VVIP after-race party experience to Kuala Lumpur, the Black Circuit Lounge in April 2011. Theme of April 2011: Bold, Stylish, Delivered in Black. PS: DJ Enferno who was originally scheduled to spin at the Johnnie Walker Black Circuit Lounge will not be able to make it due to unforeseen circumstances. DJ Bento also known as the creator of Asia’s premiere all mix party, Diamonds will be bringing his master mixing skills to the Black Circuit Lounge for his debut appearance in Malaysia. Known for exciting both international and domestic crowds mixing his unique party rocking blend of hip hop, house, electro, nostalgia and rock, DJ Bento remains one of Asia’s busiest DJs. 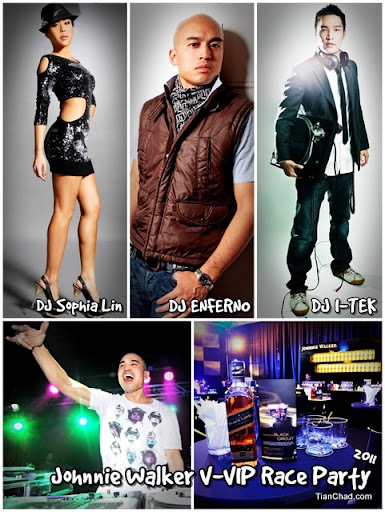 In addition to his monthly Diamonds parties at Tokyo’s Fashion Bar (in conjunction with FTV Japan), Hong Kong’s Republik and Taipei’s Primo, DJ Bento is the resident DJ for Osaka’s #1 all-genre party, Hollywood (sponsored by Ed Hardy Japan) and he performs as a feature guest DJ all over the world with recent engagements in Sydney, Hong Kong, Istanbul, Bali, New York, Beijing, Miami, Brisbane, San Francisco, Los Angeles, Kyoto, Kobe, and Berlin. DJ Bento promises to bring entertainment of the highest level to guests at the Black Circuit Lounge. What have I done to deserve the rewards of luxury and a successful lifestyle? I was facing some set backs when I told my parents that I wanna quit my 9-5 job to be a blogger+photographer instead. They were worried about my future but I insist on what I am doing and keep walking. Well, I gotta say with the spirit of 'Keep Walking' I am who I am now writing here. I am glad that I've made it to my second year and it is getting better day by day. It is tough at first but you will surely feel good when you encounter and managed to solve the challenge. I've successfully build up www.TianChad.com and it is time to celebrate my success with this V-VIP Race party! McLaren teammates Jenson Button and Lewis Hamilton celebrate a one-two finish at the Chinese Grand Prix. I am impressed with both Jenson and Lewis. At day, they push themselves very hard to be successful in their racing careers; At night, it is time to wear a nice coat and enjoy the night at Black Circuit Lounge. For your chance to win tickets to the Johnnie Walker Black Circuit Lounge, Step Inside www.blackcircuit.com.my/facebook to stay connected with insider-access and exclusive offers only from Johnnie Walker. Hope I manage to get extra passes to share with my friends! PS: If there is more than 100 Facebook Likes on this post, I might just give hint or reveal where is this party going to held at? =D So Press the like button below~!